Reverb auctions are based on a maximum bid system (technically it's called a "Second Price Auction"). When you find an item you’d like to bid on, just punch in the most you’d like to spend by clicking the Place Bid button. If the maximum you entered is higher than the bids entered by anyone else so far, you become the new high bidder. Reverb automatically "bids up" the auction on your behalf to one bid increment above your closest competitor's highest bid. 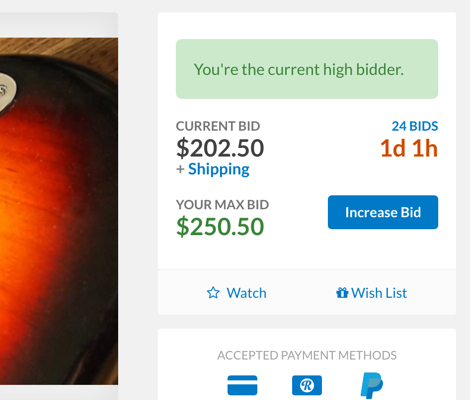 If your maximum bid is not the highest bid entered so far, Reverb registers your bid, but continues to bid on behalf of the high bidder, automatically outbidding you by one bid increment and no higher. Reverb continues to automatically bid on behalf of whomever is the highest bidder at the moment up to their maximum, until auction time runs out. No matter how high the max bid you enter is, the current bid will always increase at a fixed increment scale. This ensures that the high bidder will never pay more than the absolute minimum needed to beat the next highest bidder. How will I know when I've been outbid? You'll see it immediately in the interface if you submit a bid and someone else has a higher max bid than the amount you submitted. If you were the high bidder and you've recently been outbid, Reverb will immediatly send you an email alert to let you know you're no longer winning the auction. But don't worry: you can always enter a new bid. All Reverb auctions are no reserve auctions. This means that whoever has the highest bid at when the auction is over wins the item. Once an auction is completed, the winner can check out using the normal process found on all other Reverb listings. What are the bid increase amounts? Where can I see all my current auction activity? There's a page for auctions in the buying section of your account. This will show all the bids you've placed and their current status.